Sports Costs > How Much Does Bowling at Dave and Busters Cost? How Much Does Bowling at Dave and Busters Cost? 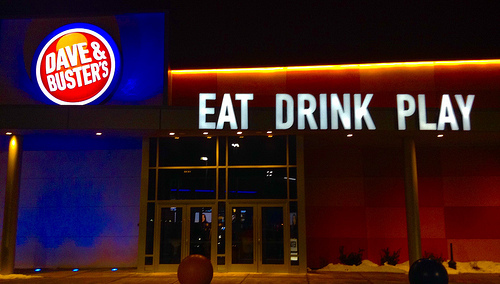 Dave and Buster’s, aside from offering games, food, a bar and billiards, offers bowling at select locations. How much does Dave and Buster’s bowling cost? The cost of bowling at Dave and Busters isn’t available on their website, but according to some sources online, it will most likely vary anywhere from $2 to $5 per game, per person. This costs, as with bowling at most bowling alleys, will depend on the day, the time of year and time. The midweek, for example, will be a lot cheaper than weekend nights. Dave and Busters provide an over the top multi-lane tenpin family-oriented bowling experience. Here, according to the official website, guests can enjoy a video wall that showcases all of the latest music videos, black light or cosmic bowling, and a full-menu service. During some special times, the bowling alley features DJ spinning Top 40 tunes and its own bar. At the end of the bowling lanes, there are flat screen TV sets. Shoe rentals, if you need a pair of shoes, can cost about $5 per person. As per Dave and Buster’s, the locations, as of 2017, which have an alley includes Concord, NC; Hanover, MD; Houston, TX; Lawrenceville, GA; Nashville, TN; Philadelphia, PH; Scottsdale, AZ; and Westbury, NY. According to the official website, it does appear they offer special promotions. For example, at the time of this publishing, they were offering half priced games every Wednesday. If you plan on doing more than just bowling, they do offer special promotion packages as well which can bring the costs down depending on what you plan on doing. During the holiday seasons, they often hold a promotion where you can buy a gift card and receive a free game play card. There are also Dave and Busters coupons available online. A quick search can often yield these, so be sure to look out for these deals before going.